BACKTOFRANKBLACK.COM: Happy Birthday Millennium: TIWWA! 9 years old! I personally have a great affinity for Millennium: This Is Who We Are, through that resource site I was introduced into the internet web community. 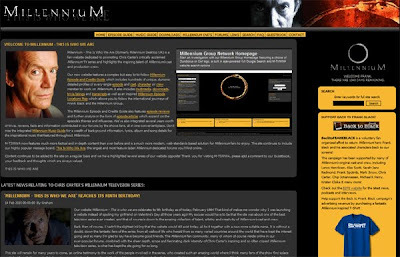 "Last year, 2009, Millennium - This is who we are (excluding our forums) received over 87,000 absolute unique visitors, almost 125,000 visits and almost 476,000 page views. Millennium may have concluded on television years ago, but interest is clearly far from over. Don't forget that you can help show this by supporting the campaign to see Frank Black return at BacktoFrankBlack.com, Lance isn't done yet, and needs your backing to deliver the good message that Frank still has work to do. Give them a warm birthday greetings on their forums. 4 Responses to "Happy Birthday Millennium: TIWWA! 9 years old!" Thank you Graham for this wonderful community...*cough* cult *cough*...which I've finally joined recently, it had been on my to-do list for a while. If you're a Millennium fan and want to indulge yourselves in Millennium goodness and talking to other Millennium fans, this is the place to be. James and Jósef, thanks for the kind words and thoughts, very much appreciated! To clarify for those interested in such things (! ), the main website is 9 years old this week, and our forum community is 7 years as of December 2009. Thanks for picking up on the point that I was trying to make in the article! Graham the site is truly amazing, it's a Millennium Museum on the internets with Free Entry and unlike Tate Modern all of the cool stuff is free to check out, really kind of you to build such a great place for fans. Thanks so much for everything you do, truly enriching, so generous of you, Happy Birthday. Thanks Chris, very much appreciated!